This set of photos are from the weekend before last when I was out with my husband. 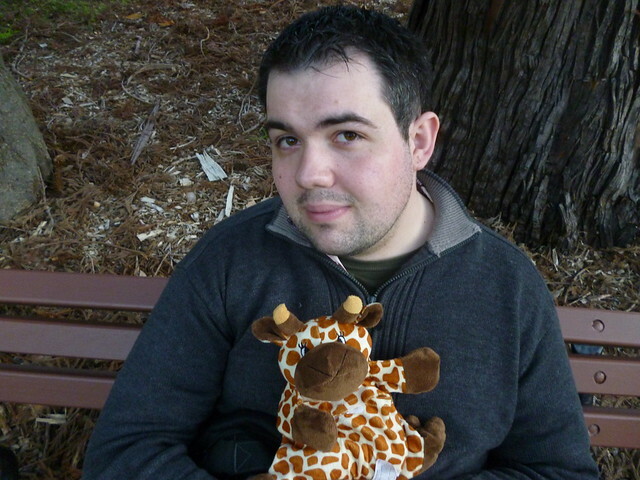 We also took Gerald who is my giraffe. I love him so much, he’s heatable and very warm and cosy especially for a cold day! He makes a valuable contribution to the photos. The dress I’m wearing here, in addition to the bicycle print dress from my previous post, are my favourite dresses at the moment; I seem to wear them almost on rotation. This dress is from Kitten D’Amour’s latest collection called Serendipity. The collar is just gorgeous; I love big collars but they can be difficult to find on clothes. The floral print is completely my style and I love the touch of the velvet with the bow. I adore the shape of this dress, it’s the perfect fit and flare for everyday. It’s also very comfortable. 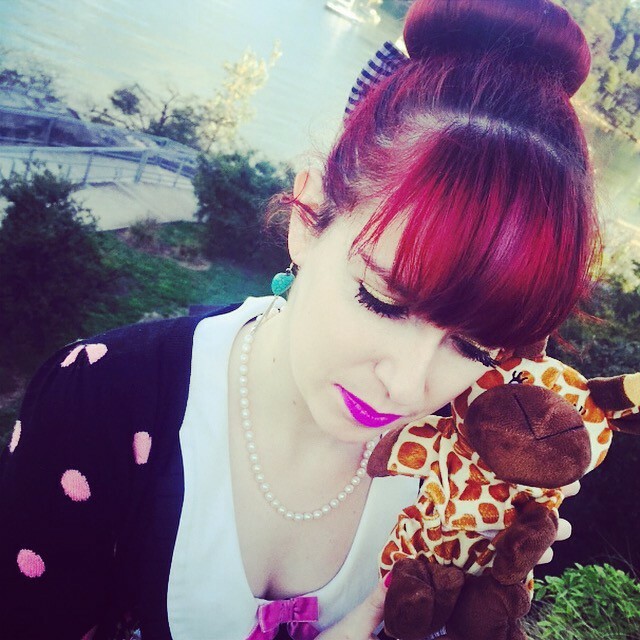 I’m always posting about how much I love the clothes at Kitten D’Amour on my blog but I’m not a total advocate for the store. There’s actually so much which annoys me about the brand. The main issue is the pushy staff. I know a number of stores like this, however Kitten D’Amour is the extreme. There are certain staff members which are worse than others. A few of the girls are fine. I like them a lot and I’ll definitely visit the store when they are working. But there are a few that I have to avoid now. It’s mainly the issues while attempting to try on the clothes. I don’t like being asked every minute if I can come out and show the staff what I look like in the clothes, it’ s even before I’ve had the chance to put on the first outfit. I’ve had times where the staff will actually open the curtains of the change room and just come in if I’m taking too long or haven’t shown them what I look like yet. I really really object to this! I’ve often had to shop online if I really want something and know that the pushy staff members are the only ones working at the time. But that’s my other point- the postage takes about a week and a half to come. It’s only domestic postage and I live in a centralised location; it even takes four days for the order to be packaged and sent to the post office. I think we, as bloggers (and also customers) should be honest about our experiences with a store. I give Kitten D’Amour a lot of time on my blog (not to mention all the free advertising!) so if there are aspects of the brand which don’t impress me I’d like to share them also so I’m providing a complete view. Now onto another brand which I have even more of an issue with and that is Guess. The Guess bag which appears in my photos below is extremely sub-standard quality. I was so happy when I found this bag as it’s a good size and a beautiful colour (marigold yellow bags can be difficult to find). However, within the first week of use the handle snapped. I then obtained a replacement bag. However, I absolutely could not believe it when the exact same thing happened, this time within only four days. I was extra extra careful with the second bag and it broke even more quickly. These are expensive bags. My was bought at a discount but for the retail price of $169.95 this is terrible. I’m very disappointed as I’ve always loved Guess and most of my bags are by this brand. However, experiences like this change my opinion and I don’t want to buy any more Guess bags for now. Now onto a more positive fashion experience. I absolutely love coloured tights at the moment and I can’t believe I’ve only just introduced them into my wardrobe. I had thought about it many times before but never felt like I could make it work. I started off with the pair I’m wearing in this post and then last week become more daring when I purchased a number of coloured tights in the end of winter sale at H&M. I now have purple, red, blue, green, mustard and white. In addition to the pair in this post, my favourites are the red and the blue. I love wearing them because they are so warm and cosy. I like to think they often add to my outfits. I’ve seen coloured tights worn frequently on other blogs but almost never ‘in real life,’ so I like that unique aspect too. 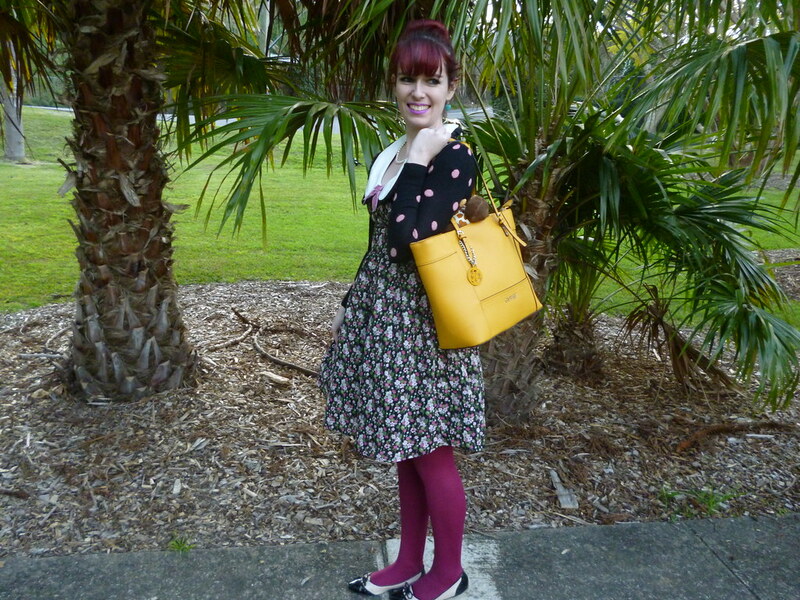 This entry was posted in Alannah Hill, Day Trips, Guess, Kitten D'Amour, Outfits. Bookmark the permalink. So lovely! And wow, that shopping experience does sound rather annoying. I prefer to be left alone when I shop, especially when I try on clothes! nice 🙂 greetings and kisses! Hi, dear Imogen! Glad to see you and this cute giraffe, too! I loved it, really an enrichment to the photos, like you said! I love Kitten D'Amour, not because I know it well or have any item, but because I always see you saying the best things about it! I loved the dress and the cardi, and also the tights – I seldom wore colored tights, but I like this pair, such a nice color! I could wear them too, maybe I try soon! I liked the bag color and style as well! True, Guess is an expensive brand and having two bags, one as a replacement, with the same problem happening in a few days… who would like to buy it now! I hope you have a very nice week, enjoy it a lot! I can't hardly believe that their staff can be so pushy, I totally get it why that bothers you…coming in while you're trying on clothes and not being able to wait…why should you show them how you look anyway. It is your personal choice. I often buy something even if I don't walk out out of the wardrobe. I never liked being looked at by people in the store or even the sale ladies. Anyhow, you have given this brand a lot of place on your brand so you should feel free to say what bothers you too. Perhaps they change their ways some day. Interesting to hear about your Guess experience with that bag too. Moving on, you look totally amazing in this dress! you are always so feminine….and pretty!!!!!! I KNEW you'd love the Cinderella shoes!!!! They're so you, it is untrue!! Your new dress IS lovely but what a shame about the pushy staff!! What??? You've never worn coloured tights??? Welcome to the club!!! My favourite are purple! Wow it sure sounds like you have had some good and bad shopping experiences lately! I do love that dress! Too bad the service in the store is so bad. Also sorry about your Guess bag. I have found the same thing lately with them. Well at leat you look amazing and I love the tights. You look amazing in this dress. Hope you have a great week. So Cute! Love your colored tights and those BAIT shoes are amazing! They go so well with that dress! Your Kitten D'Amour Serendipity Collar Dress is very pretty. I love its shape, print, short sleeves and collar with bow. I also love the colours of the highlights in your hair, of your lipstick, and of your H+M tights. thank you for your comment sweetie…and I wish you a lovely day! Wow I love all the purples and greys of this look, such a beautiful and perfect color combination! Very cute pics and look! What a great outfit! I love the pop of colour in your tights. Can't believe how pushy the sales assistants are – I would definitely not be shopping in store at all, even if online ordering took so long. Always amazes me how places like Shopbop can get my order to me in 3 days from overseas, while stuff inside Australia can take a week or more! Shame you've had a bad experience with the Guess bag too, it's such a nice colour, especially with this outfit! I had a problem with a high end designer before, Chloe, and I ended up selling most of my handbags from them as I just couldn't trust the quality or the customer service! I tend to stick to brands that I know have the quality behind them, and that I am able to get a great response from if something goes wrong. Hopefully they refund you for the bag, having 2 break in the same way is just not right! I love the colors mixed:). It's amazing to see the match and mix:). Ps, you did great on this look, I love it. 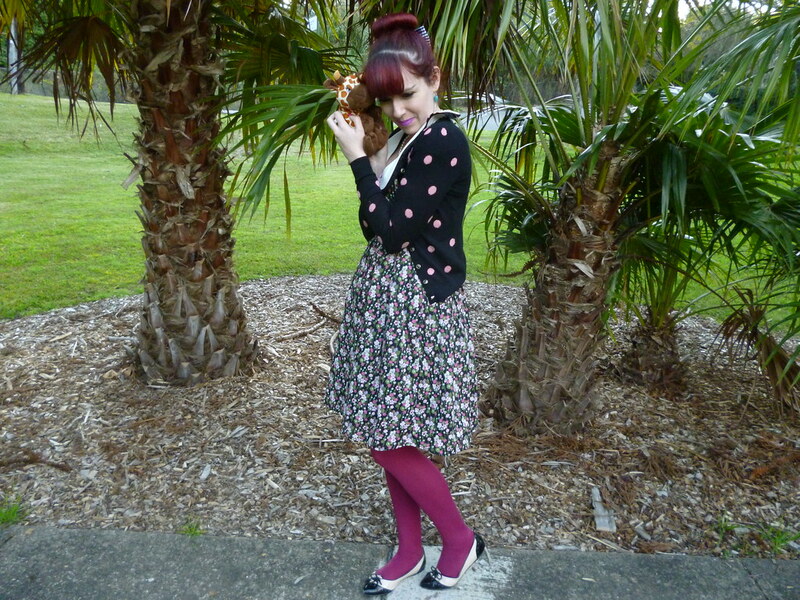 Wow, I LOVE this look, the dress is so pretty and I adore the flats and dotted cardigan. Oh, the giraffe! so cute! 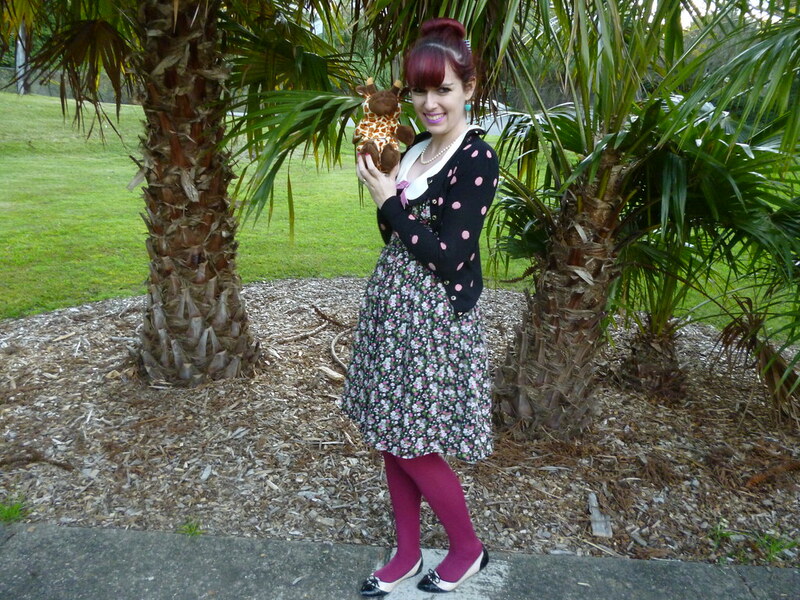 You always look so cute, I love your dresses and cardigans!